After acrylic nail removal, there are a number of ways you can bring your natural nails back to their former glory. Weekly manicures: Regular manicures, although an additional expense, help stimulate the circulation of the nail bed, promoting its growth. 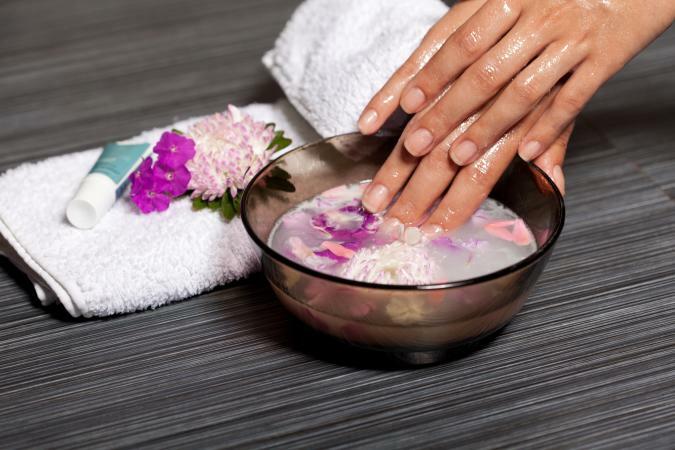 If you would prefer an at-home manicure, simply fill a bowl with warm water, and allow fingers and cuticles to soak for at least 10 minutes per hand. Follow the nail bath with a stimulating massage on each hand. Cuticle oil: Cuticle oil, such as vitamin E or olive oil, should be applied during the massage. 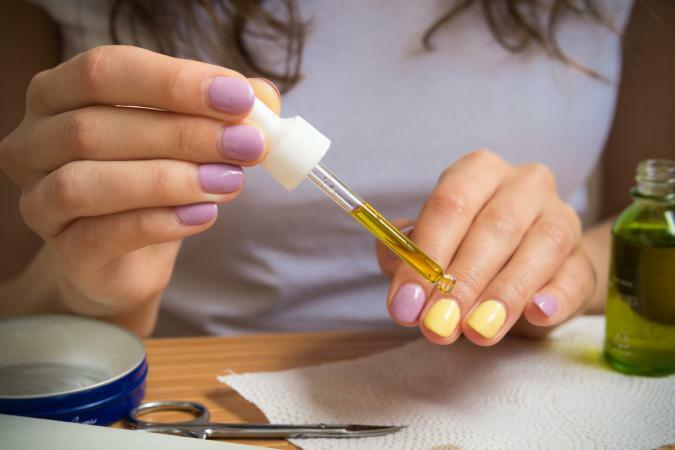 The essential vitamins found in these natural oils will help promote healthy nail growth. One option is the Sally Hansen Vitamin E Nail and Cuticle Oil (about $5), which prevents ridges and increases nail flexibility. Trim nails: As nails begin to grow, keep them trimmed. Don't be in a hurry to grow your natural nails long. Instead, make overall nail health and thickness your goal. A thin, damaged nail that grows quickly will not last. Rather than deal with disappointment, understand that your nails may need to be kept short while the body rebuilds the damaged tissue. Apply strengthening products: Many nail care base coats have strengthening and stimulating properties, like the OPI Nail Envy Nail Strengthener (under $20). Find a base coat that will help strengthen the nail bed and apply the product every three days as needed. Ridge fillers: Ridge fillers work wonders for covering up the unsightly torn and jagged ridges that may remain on the nail bed after artificial nail removal. Apply a ridge filler directly under your nail polish layer. The Barielle Hydrating Ridge Filler moisturizes and conditions the nail - and only costs about $10. Avoid color: Although you can still paint your nails as desired, reduced exposure to chemicals is preferable, especially as your nails rebuild their strength. If you must wear nail polish, try alternating one week on, one week off. Treat any infection: Acrylic nails that become separated from the nail bed can become a breeding ground for fungus and bacteria. If your nails are thick or discolored, or if you experience redness or pain, see your doctor immediately for treatment. Take care of your body: It is also important to focus on your diet. For instance, knowing what to eat for healthy hair and nails can make all the difference. Drink at least eight glasses of water per day, eat foods with biotin (like bananas and salmon), make sure you get enough protein, and indulge in dark leafy vegetables. There is a reason these issues occur. Chemicals involved in acrylic nail application, including nail sculpting powders and gels, cause damage to the underlying nail. Depending on the length of wear and the health of the nail prior to application, the extent of the damage can vary. There are many reasons women choose to go back to natural nails. Issues like cost are a big factor for many women. Maintaining salon appointments can be expensive. Time restraints, as an appointment can last up to an hour, are another deterrent. Nail health is another big concern. According to Huffington Post article "Why You Should Be Cautious of Getting Acrylic Nails," artificial nails increase the risk of infection. The use of certain chemicals (an allergy to the resins and formaldehydes used can result in pain, swelling, burning, and nail separation for example) is another reason woman may decide to return to natural nails. When it comes to the removal process, the first step is to remove the acrylic or gel nail tip. This can be done either professionally (best choice) or at home with the use of pure acetone. At home products are typically inexpensive (Supernail Pure Acetone, for example is about $7, making it an affordable option.) Keep in mind acetone is extremely drying, so use the chemical wisely. Many people opt for professional removal of their artificial nails to minimize additional damage. Nail damage is dependant upon a number of factors, for instance, the length of time acrylics were worn. Once the false nails have been removed, you may find that the nail bed appears jagged, dry and shocked. This is because the natural nail has been kept from oxygen and has had decreased stimulation. That causes stunted growth of both the nail bed and fingernail. Wearing artificial nails once (they typically last for two weeks until they need to be filled) before returning to natural nails is unlikely to cause a serious issue. Your nails may feel weak or soft but will return to normal after a few days. If you have been wearing acrylics long-term, the damage will likely be more severe. Blogger Amelia Rushmore-Perrin wore acrylic nails for six years and found her natural nails were weak, split, and extremely painful. Another beauty writer wore acrylics for 10 years - and discovered her natural nails were fragmented, jagged, and unhealthy. Before the removal process, try to prepare yourself. Understand that your nails will not look picture perfect right away. It takes time and effort to restore them to their former glory. To make the transition as seamless as possible, take steps towards achieving nails that are healthy and strong. Returning to natural nails after acrylic is a process that requires patience and realistic expectations. Once you've become used to the durability and thickness of artificial, your own nails may not be as appealing. Keep in mind the long term benefits of natural nails include less maintenance and reduced chemical exposure, not to mention less money spent at the salon! Once nails have returned to a healthy state, treat them well and paint them with fun, bright-colored polish. Although they may be shorter and thinner than their artificial sisters, daily care will be easier and more rewarding.